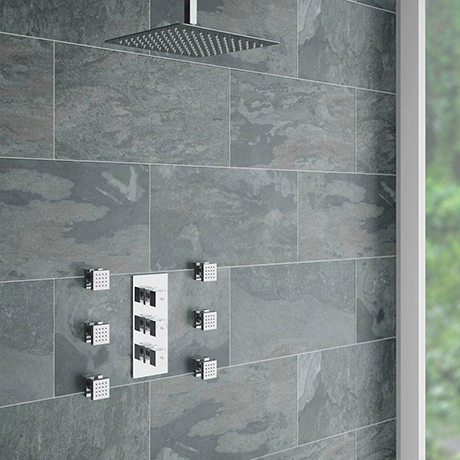 The modern square 2 outlet shower package brings substantial elegance to the modern bathroom. The triple valve enables you to select the minimalist design ceiling mounted square shower head for a satisfying shower experience and 6 body jets which are perfect for creating a shower that massages you. Suitable for all types of plumbing installation this shower valve has the added safety benefit of a built in anti scald device should the cold water supply fail. This incredible package is perfect for the modern bathroom, looking to add a touch of style and sophistication. The stunning design can complement any contemporary style bathroom and each item has been built to the highest standards of today's manufacturing capabilities. Please note - Certain parts are chrome plated plastic, not metal.